So you’ve done it! You’ve persevered and now you have completed both your educational and supervised clinical experience requirements. You are now a full-fledged independent speech-language pathologist (SLP) ready to make a difference in the world. You're ready to look for your first SLP position. The recruiters have begun their calling, emailing, texting, sending postcards, etc. You know the positions are out there, but you don’t know which ones to apply for and which ones to avoid. Obviously you know to consider settings, ideal patient populations, pay, work environment, location, benefits, etc. while looking, but those elements are just on the surface, it is what’s creeping under the surface that you should watch for. As an example, has this situation ever happened to you? I once peeled and bit into a juicy orange – oh it was amazing – only to catch sight of something green wiggling on the inside. Uggh. I spit it out and chucked it as far from me as I could. Yuck. Some jobs are like this orange. They look amazing on the outside, but once you’re in them there’s something repulsive on the inside. How can you spot these types of jobs early on and avoid the toxic stress that comes with them? Did you know that stress is the silent killer? We know from the literature that high levels of the stress hormone cortisol in the body over a prolonged period of time can result in many terrible health consequences and can hasten an early death. This is why stressful work environments are called toxic – they literally are toxic to your body. 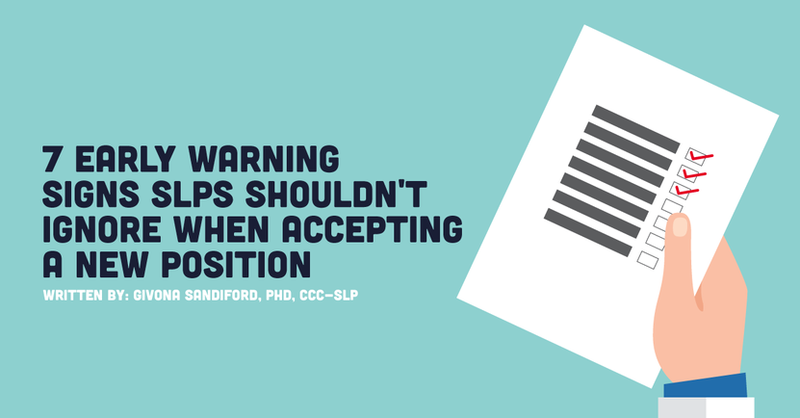 Here are seven early warning signs that I have overlooked at one time or another in my nearly 15 years as an SLP. I share these early warning signs with you so that you can be on the alert for and avoid a potentially toxic work environment! Please don’t do this to yourself! Imagine you meet with the owner of the cute clinic you pass by daily on your way to the gym. Perhaps it is a smaller facility and they really want you to work with them. The owner seems nice. They verbally offer everything you could ever dream of in a job. Great hours, great pay, great benefits, etc. It seems almost too good to be true! You leave very excited and accept the job the next day. A few weeks in, you start to notice what you were promised is not what you are receiving. It’s gotten so bad that you don’t even know how much you will be paid or even when you will be paid. Not good. While in some states, such as California, oral agreements are legally binding, how will you prove the terms that were agreed to if you do not get it in writing? You need to get and keep a copy of your contract with all of the terms offered to you at your time of hire clearly stated in the contract. An employer who does not offer you a written contract is not protecting your interests. I was once reading through a contract and came across a line that prohibited me from working within 20 miles of the job location within 2 years of leaving the job. Um – what? I lived within 20 miles of the job location. This would mean that they were attempting to prohibit me from working near my home for two years in the event that I left the job. Not good. Did you know that non-compete agreements are illegal in some states? In California where I live, for example, a non-compete clause cannot prevent an employee from future gainful employment after the termination of employment. You should check with a legal representative in your state for your state laws on non-compete clauses. But in the meantime, be on your guard if you see something like this in your contract. It may be a sign that your employer is far more concerned about preserving their self-interests than the interests of its employees. Assuming you got a written contract and read through it carefully, you should be on the lookout for contract violations within the first few months of employment. Things happen and there are times when an employer may breach your contract. Depending on the nature of the breach you may decide to overlook it, but what shouldn’t happen is for the breach to take place without a discussion taking place first. Not good. The breach shouldn’t significantly alter your work environment and quality of life in a negative way. A company that is repeatedly ignoring or changing the written agreement they made with you without so much as discussing it with you first is an employer who either does not have your well-being in mind or has an unstable business structure. Either way, is this where you want to be? Is everyone in the department a relatively new hire even though the company has been around for years? Are there no or very few veteran SLPs? What happened to the other workers? Where did they go and why did they leave? I once worked a job where literally more than one person would not show up to work the next day - just out of the blue. The turnover rates were astronomical within that organization. They had a practice of changing work holidays at the last minute after their employees’ holiday tickets had already been purchased. There was a lot going on below the surface that I overlooked upon accepting the position. High turnover is a sign that something is very wrong with the organization. You should be on your guard if you see this and carefully consider if this is where you should be. You have a concern. You follow the chain of command and email your manager. There is no response. You call. There is no response. You follow up with an email after your call – no response. Weeks pass, the situation escalates and you are unsure what to do. You feel alone and unsupported. You call your manager again. There is no response. Managers are busy, but their jobs are to manage. Neglect can be a form of abuse just as yelling or calling names is a form of abuse. You cannot effectively do your job as a speech-language pathologist if you do not have the appropriate support. This affects your clients/patients negatively and can be unsafe for your own mental health. Not good. Be on your guard during your interview and hire process against this type of manager. When you get the job offer and you call with questions about the job, are your calls returned in a timely manner? A good manager in a bad company is more tolerable than a bad manager in a good company. Consider carefully who you are working under. I once sat in a speech only Individualized Education Program (IEP) meeting where the principal told a weeping mom that the school would not complete any additional psych assessments until the end of the school year for her failing son because the school psychologist was too backed up. It was the beginning of the school year. This completely violated this family’s rights and was not the method by which such a statement should’ve been made. Sometimes laws are broken out of ignorance and sometimes out of convenience. We have unfortunately read horror stories of speech-language pathologists who have lost their licenses over fraudulent practices. I often wonder if the practices were initiated by the SLPs or mandated from someone higher up. We’ve worked too hard to make it for this to happen to us. If you are beginning to notice strange practices in your work location and you feel uncomfortable being a whistleblower, it may be time to consider whether this is where you need to be. I noticed something after finishing school. In school you are in a class striving to learn and achieve a grade that shows how well you have learned what you were meant to learn. That grade means something. With enough of these types of grades you will march to music with a fancy gown on and receive a nice piece of paper for your wall showing all you’ve managed to overcome to succeed. The feeling of euphoria you have when you are done is amazing. You did it! Woohoo! In the workforce you’re no longer working to graduate. You have new goals now. You hope your patients will make progress. You hope you will get all of your work done in a timely manner. You work and you get a paycheck. After a while the daily grind can become monotonous if you have no room to grow and learn within your current setting. I once stayed at a job for seven years and the time flew by. In this job I was on several innovative teams. We developed several systems to make the therapy model more effective and efficient. I was eventually made co-lead with another co-worker. Growth opportunities made the job amazing. Alternately if there are no growth opportunities, if innovation is frowned on, and new ideas ignored -- burnout and boredom may be eminent. Not good. How do you avoid working for a company that manifests these horrible symptoms of a toxic workplace? READ your contract and re-read it again. You can never read your contract too many times. Have someone else read it over. Ask questions about the contract. If something doesn’t make sense ask what it means. Get the response in an email so that you have a written record of the clarification somewhere. If you are working in a union environment, know who your representative is in case of further contract questions. If feasible negotiate for better working conditions before signing the contract. Depending on your work setting and how great their need for you, you may be able to negotiate for preferred hours, preferred pay, etc. The time to negotiate is before you accept the job and while you have multiple offers on the table. The shortage of SLPs in the workforce is still very real. This may change in the future, but for now this gives you a certain amount of leverage as an onboarding new employee depending on the work site, to request what you need. Get it in writing! Anything agreed on verbally needs to go in the contract! Always consider all of your options carefully. Run your options by your loved ones. Don’t be afraid to leave an unhealthy work environment. None of us is clairvoyant. Okay you didn’t see it coming, move on and learn from it. Just be sure you research your next position more carefully! I hope that these tips will help you in your journey as a new SLP entering the workforce. May your journey bring you, those you love, and those you help joy and may you always feel safe and valued in your workplace.